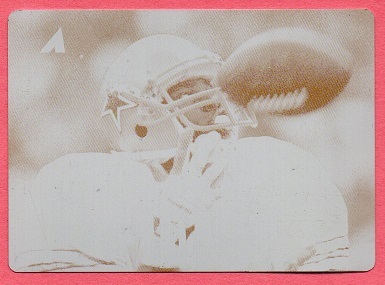 In 1997, Pinnacle Brands randomly inserted in its Pinnacle football set; as well as other sets, the original individual printing plates used to make each card. There were a total of 8 examples for each card. They featured the four colors used to make the card: Black, Cyan, Magenta and Yellow; and both the front and back of each plate was randomly issued. The plates were signed by then CEO of Pinnacle Brands, Jerry Meyer. The idea was tried again in 1998, but those plates were unsigned. Things didn't work out profit wise, for Pinnacle, and they declared bankruptcy in 1999. Meyer was named Beckett's Sports Card Executive of the Year in 1998, but because the company went bankrupt just a short time afterwards, the award was discontinued. 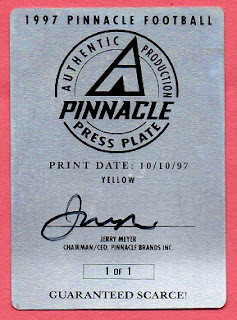 I remember reading somewhere that if one was lucky enough to pull all eight plates for a particular card, that there was a bonus from Pinnacle of several thousand dollars. I don't know if that was true or not. The plates now pop up once in a while on the secondary market, and are usually pretty pricey. This is the second printing plate I have in the Hoard, but so far, the only signed edition.